Think Cinnamon toast, but with almond butter, apple slices a touch of sweetness from an almond date crumble and a final drizzle of agave. 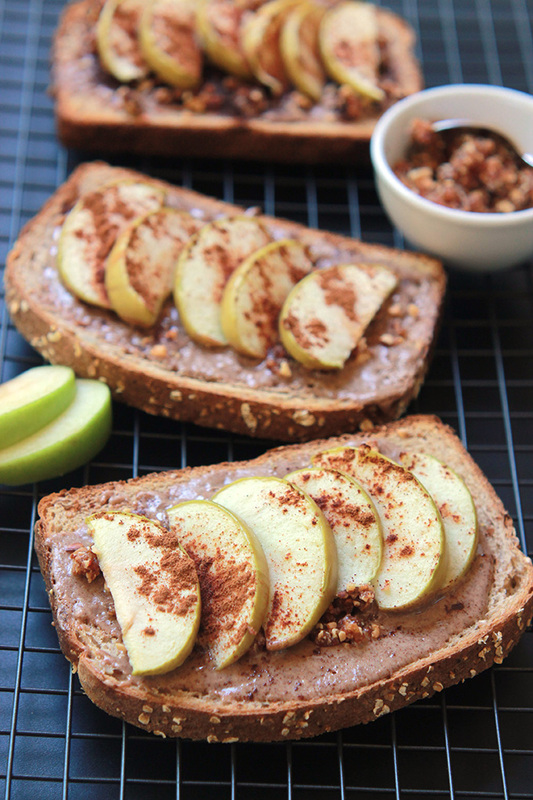 Almond Butter Apple Cinnamon Toast is my twist on an old after-school snack favorite. As a child my siblings and I used to enjoy cinnamon toast as an after-school snack. This is a new twist on that old favorite. 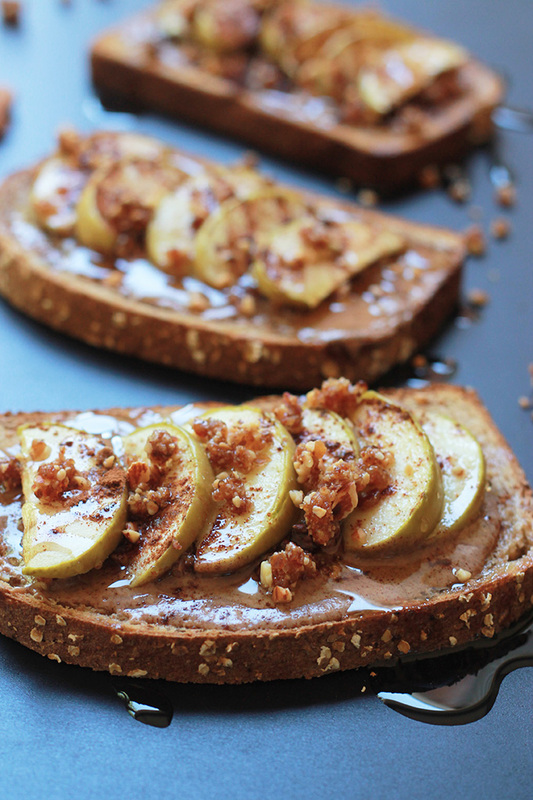 This isn’t your old school cinnamon toast, I added almond butter, sliced apples and a tasty almond date crumble. 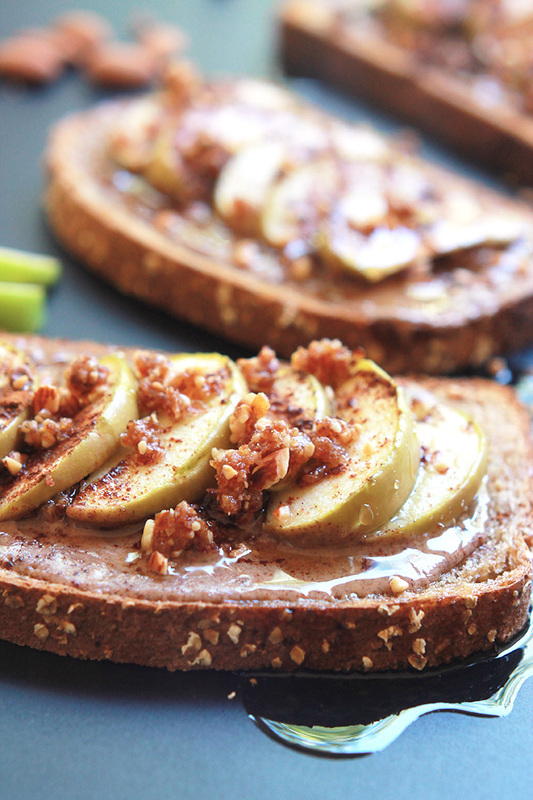 This toast takes cinnamon toast to a whole new level. There is however another difference from the cinnamon toast of my younger days. There’s no white sugar mixed with the cinnamon, I used dates and agave as sweeteners. I’m trying to reduce my use of refined sugar, that’s why I used dates. I have a big sweet tooth, big and it’s hard, so I’m slowly reducing my intake of added refined sugar. If dates aren’t your thing you can use the agave only or honey. I included a picture of the almonds and dates to show you what it should look like when processing. 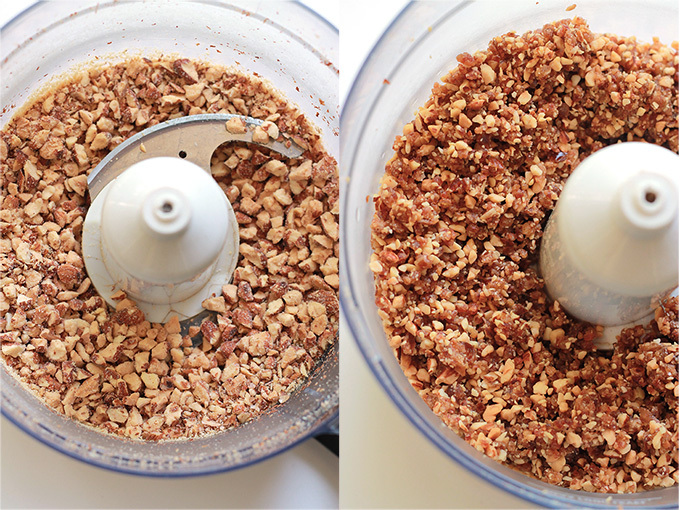 The first photo is what your almonds should look like before adding in the dates. The second is what you should have after processing in the dates. 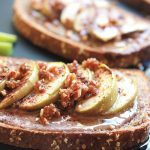 We had cinnamon toast as an after school snack but this Almond Butter Apple Cinnamon Toast makes a filling breakfast as well. 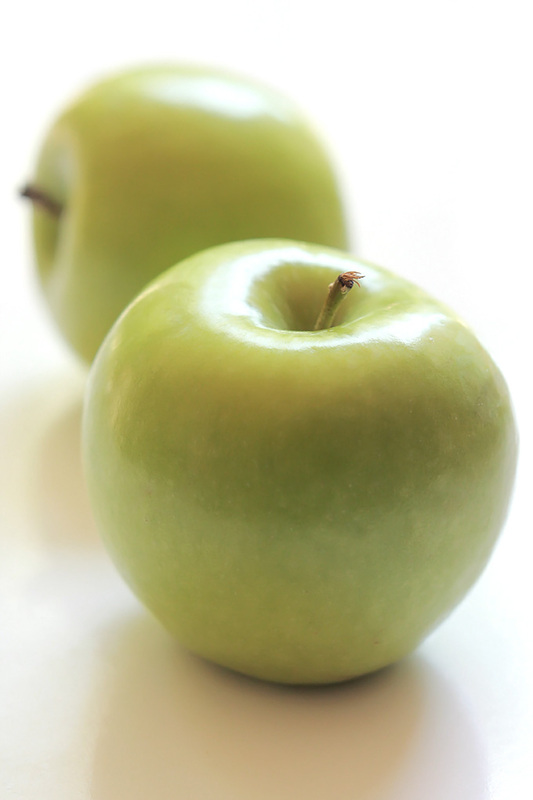 What were your favorite after school snacks and what kinds of snacks do you give your after schoolers? If you make this recipe or a version of it, take a picture and share with me on Instagram, tag it #thewholeserving or leave a comment below. 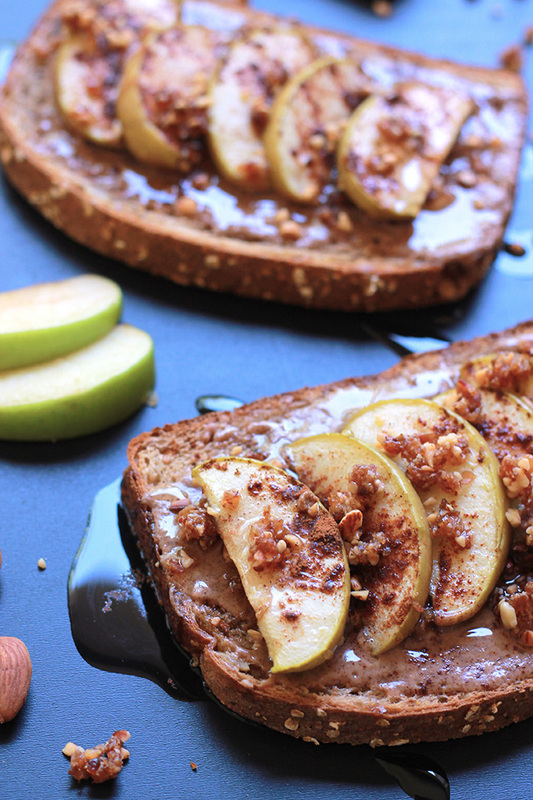 I’d love to see or hear about your version of Almond Butter Apple Cinnamon Toast. This really looks awesome, Celeste! Thanks Carol, it taste pretty awesome as well. This! For breakfast??? What a great way to start the day! Yeah, it makes a great breakfast or snack. Love it. This looks like a delicious breakfast option. Thank you for sharing the recipe with us. You are welcome Crystal, It does make a great breakfast. You are right about that, I’ve enjoyed this deliciousness with a cup of coffee many a mornings. I wish I would have become a vegetarian sooner, better late then never I guess. I hope your kids enjoy these. This is absolutely mouthwatering Celeste. It makes me want to have breakfast at 11 in the evening. Pinning for sure! You know what Mary, this makes a wonderful mid-morning snack or late afternoon snack, just about anytime of day is a good time to have this. Enjoy. That looks utterly delicious! Thanks for sharing on the What’s for Dinner link up and don’t forget to leave a comment at the party – Next week’s features that also leave a comment get pinned and tweeted! Celeste, this looks so good! We had cinnamon sugar toast to start the day, and it was good. Occasionally we would have leftover pie crust cooked with cinnamon and sugar on top! This looks much more my style now! And I love almond butter! I have never heard of the pie crust with cinnamon, but it sounds delicious. That would be a great way to bake apple pie with cinnamon sprinkled over the crust. You’re welcome Michelle, it’s pretty tasty. Oh hey. Don’t mind me. I’m just sitting here kvelling over that almond date crumble. Thanks for bringing this awesomeness to #SaucySaturdays, Celeste! Yum this sounds so yummy. Thanks for sharing with us at Family Joy Blog Link Up Party this week. Hope to see you next week! Your almond butter looks so good and it looks super healthy. That’s why you’re my pick for this week’s Featured Blogger at the Over the Moon Link Party. 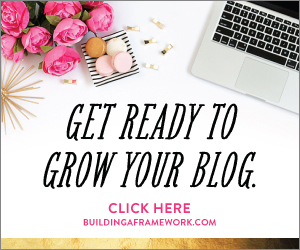 Come back from Sunday evening thru Thursday evening to get your Featured Blogger badge. Congratulations! 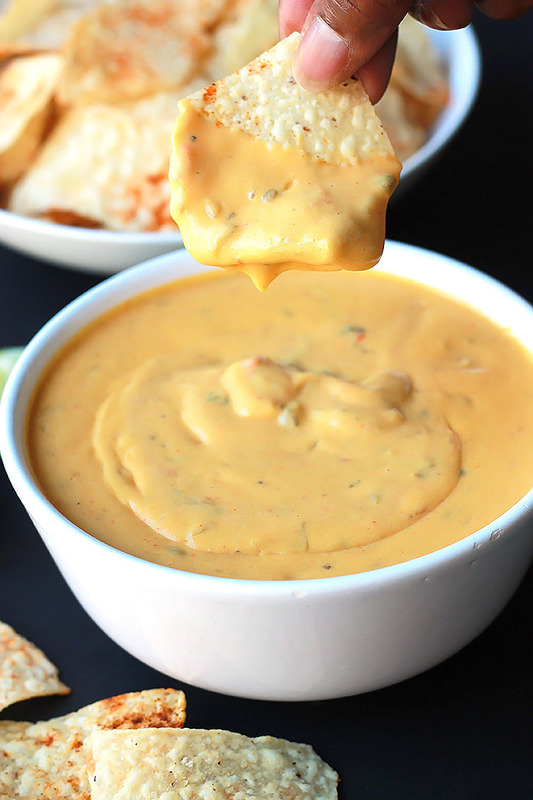 This looks amazing and sounds like the perfect after school snack! Thank you for sharing at Merry Monday! I’s a tasty snack and I like having it for my mid-afternoon snack and sometimes as a breakfast.